Amaro Lucano is a Southern Italian herbal liqueur made from over 30 macerated herbs and essential oils. Originally created in 1894 by a family-owned company based in the small town of Pisticci it gained notoriety after the company became the official supplier to the House of Savoy whose coat of arms appears on the label. 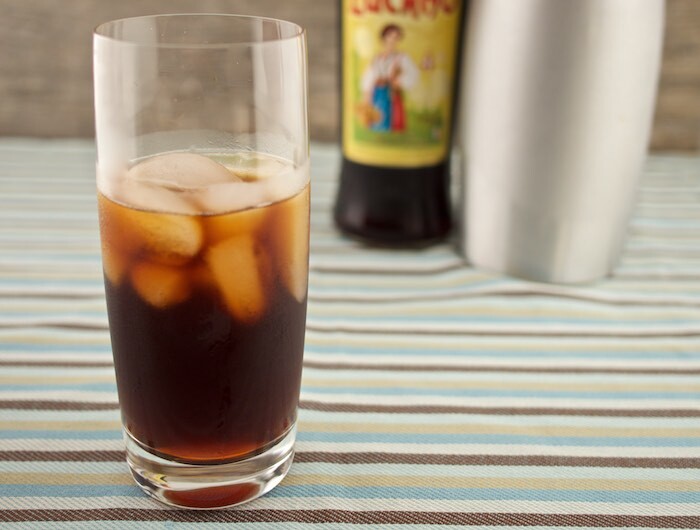 Amaro Lucano is light brown in color and has a bittersweet flavor. Though commonly served as a digestif after a meal, I enjoy it mixed with cold brewed coffee and seltzer water as a mid-day refresher. Chilled with ice it's a bold, slightly sweet beverage with complex flavors that awaken the senses. Mix in a tall glass with ice and top with seltzer. I have a bottle of Averna Amaro, but I haven't seen the Amaro Lucano before - I'll keep my eye out for it. This sounds like a lovely cocktail. That would have been great for this afternoon! I'm up for all things mixed with coffee. Sounds like a fun recipe! Coffee + Seltzer! That's an idea I never ever thought of! This looks great! Boozy, sparkling coffee is genius. So glad that I found this via Try a Bite Tuesday! This is my kind of cocktail!! I would love it if you would link it up to Tipsy Tuesday at Grey is the New Black!